Get 10% off your next purchase when you sign up for email. Valid on first-time email address submissions only. One-time use. NOT VALID ON PRE-ORDER. LIMIT OF FIVE PROMO CODES PER ORDER. 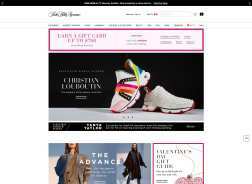 Valid on saks.com purchases from 1/3/19 at 12:01 am (ET) through 1/5/19 at 11:59 pm (ET). Enter promotional code at checkout for saks.com and catalog purchases. Offer and code valid once per customer. Full value of coupon must be used at time of purchase. Get $50 off every $250 you spend, up to $500 in savings is for promotional purposes only, without money or other value given in exchange, and is non-transferable. This offer cannot be applied as credit to previous purchases. Coupon may not be redeemed for cash or used as payment or credit toward Saks Fifth Avenue credit card accounts. Cannot be combined with any other offers. Discount is applied to all items purchased and is not adjustable for returns. Now available, shop and purchase online, and pick up your items at your preferred location! Get up to 75% off selected women’s and men’s apparel. Get Free 2 Day Shipping Via Shop Runner when you make purchase through Mastercard. You must sign in into shop runner. Get Up to 60% Off Selected Glamorous Designer Women’s Apparel. Valid on selected items and Vendors. The Swim Sale! Get 30% Off original prices on Select women’s swimwear.